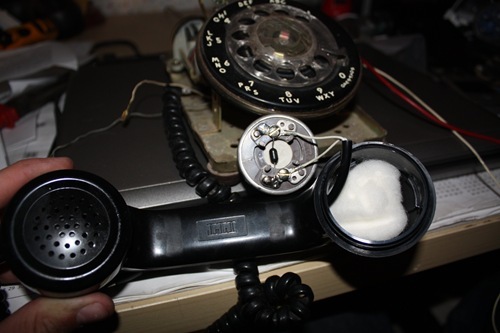 After being asked how one would go about adding a microphone and headphone jack to a phone so that a headset could be used, I decided to take a look for myself and figure out what to do. Here is what I found, however, I didn’t actually add the jacks as I have no need for them. For these instructions I did hook a microphone and headset up to the phone and it worked. First you will need to locate the wires going to the handset. There will be 4 wires going to it from the inside of the phone. 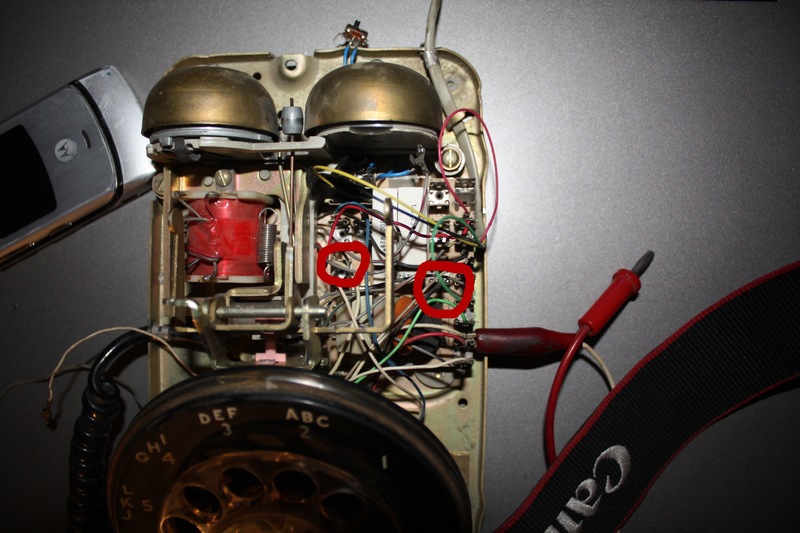 Here you can see the 4 wires coming from the handset on this phone there are 2 white wires and a red and black wire. Once you have located the wires you will need to determine what each one does. For this I took the handset apart to see which wires went to the speaker and which wires went to the microphone. I was able to determine that the two white wires went to the speaker and the red and black went to the microphone. Now you can go back to the base of the phone and follow the wires. Two of the wires should lead to the same place as these are the ground wires for the speaker and microphone. 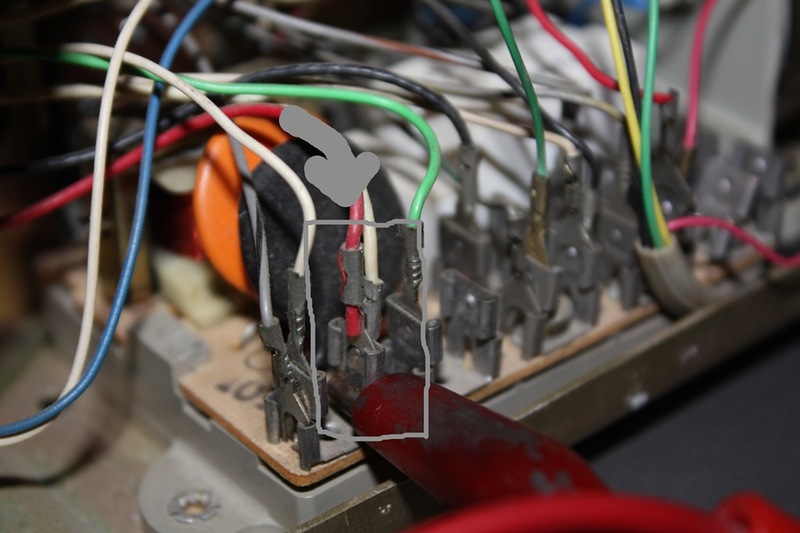 Here you can see that the white wire and the red wire are the ground wires and connect to the same terminal. Now follow the other two and note there locations. Now you will need to add the jacks to the phone. For this you will need to buy two jacks like these 1/8″ female headphone jack. 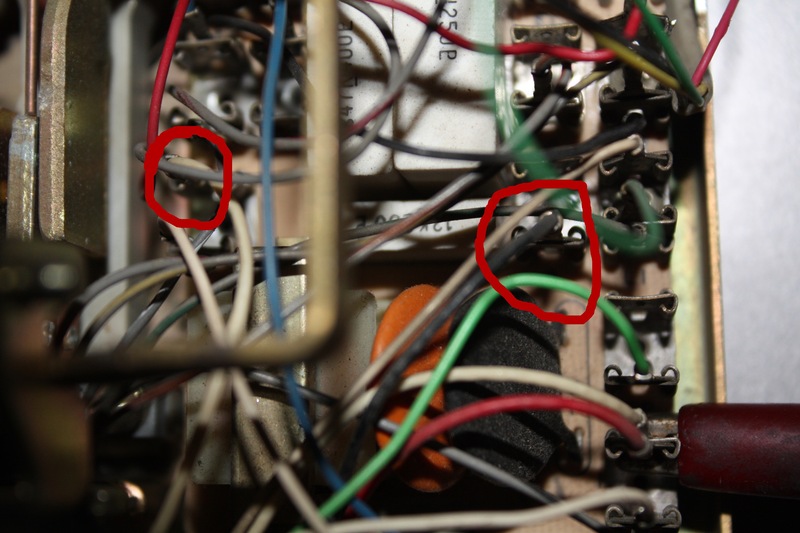 Then use the included wiring diagram to solder from the ground wire for the microphone and speaker (where 2 of the wires connected) to each of the ground terminals on each jack. Then wire the other to “hot” wires to their respective terminals on each jack. Now you have your microphone hack and headphone jack. The only thing left to do is install a switch on the wires that are connected and disconnected when the handset is lifted away from the base. This is because only when the handset is removed from the base is the phone “on” and able to dial numbers and answer calls. By adding a switch here you will be able to use your headset without lifting the receiver off the base. 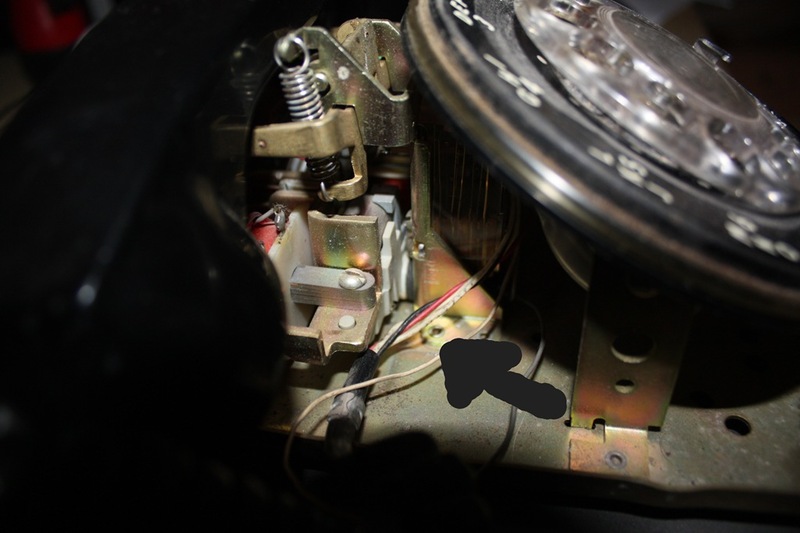 Can you help me put a ringer light indicator on my rotary 500? could I just install one jack on the phone or is it necessary to have a headset with two plugs and install 2 jacks on the phone? I believe it can be done either way. But you would need to research the specifics of using one jack as the wiring will be different for the two setups.